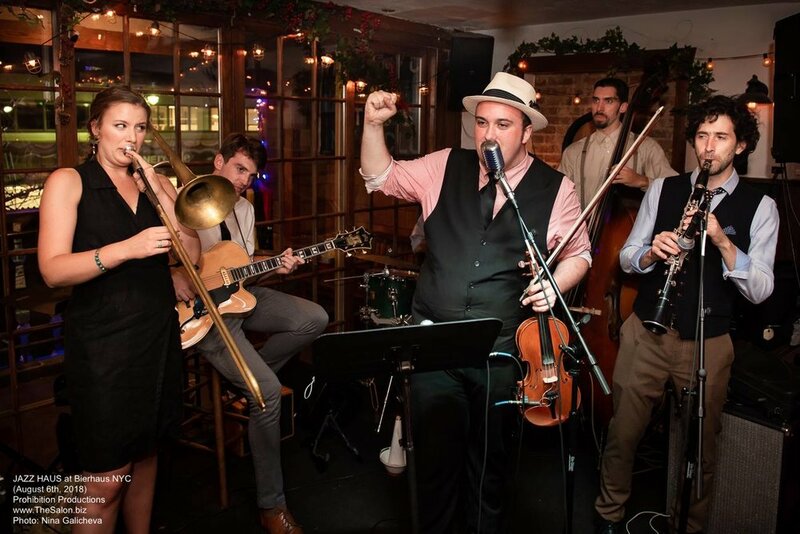 THE HOT TODDIES w/Hannah Gill on "420"
Join The Hot Toddies on Saturday, April 20th for a swinging night of dancing & lounging as we celebrate "420" with Reefer tunes from the 1920's and 30's! We'll play three long 60 min sets of hot jazz n swing starting at 7pm with a stellar lineup featuring Gabe Terracciano (violin), Vinny Raniolo (guitar), Dan Levinson (reeds), Ian Hutchison (bass), Patrick Soluri (drums) - plus special guest vocalists Hannah Gill after 8:30pm! The Hot Toddies are thrilled to be play at the Gotham Jazz Festival 2019 (April 28th) in the beautiful Library of the The Players Club with an all-star lineup! We're kicking off the Festival with a 60 min set from 12:30-1:30pm and stellar lineup featuring Gabe Terracciano (violin), Gordon Webster (piano), Justin Poindexter (guitar), Ian Hutchison (bass), Patrick Soluri (drums), plus special guests Leonardo Sandoval (tap dancer) and Hannah Gill (vocalist)! Join The Hot Toddies on Saturday, May 18th for a swinging night of dancing & lounging at one of our fav spots, Hofbräu Bierhaus NYC!! We'll be doing 3 long sets of hot jazz n swing starting at 7pm with a stellar lineup featuring Gabe Terracciano (violin), Dan Levinson (reeds), Justin Poindexter (guitar), Ian Hutchison (bass), Patrick Soluri (drums), and special guests Leonardo Sandoval (tap dancer) joining us at 8:30pm, and Cait Jones (vocalist) joining us at 9pm! Join The Hot Toddies on Saturday, April 6th from 7-11pm, for a swinging night of dancing & lounging at one of our fav spots, Hofbräu Bierhaus NYC!! They've been clearing tables for us to make space to dance! We'll be doing 3 long sets of hot jazz n swing starting at 7pm with a stellar lineup featuring Gabe Terracciano (violin), Dan Levinson (reeds), Justin Poindexter (guitar), Ian Hutchison (bass), and Patrick Soluri (drums)! Join The Hot Toddies on Saturday, March 23rd from 7-11pm, for a swinging night of dancing & lounging at one of our fav spots, Hofbräu Bierhaus NYC!! They've been clearing tables for us to make space to dance! We'll be doing 3 long sets of hot jazz n swing starting at 7pm with a stellar lineup featuring Gabe Terracciano (violin), Dan Levinson (reeds), Justin Poindexter (guitar), Jared Engel (bass), Patrick Soluri (drums), and special guest Leonardo Sandoval (tap dancer) joining us at 8:30pm! Join The Hot Toddies on Saturday, February 23rd for a swinging night of dancing & lounging at one of our fav spots, Hofbräu Bierhaus NYC!! We'll be doing 3 long sets of hot jazz n swing starting at 7pm with a stellar lineup featuring Gabe Terracciano (violin), Dan Levinson (reeds), Vinny Raniolo (guitar), Ian Hutchison (bass), Patrick Soluri (drums), plus special guests Leonardo Sandoval (tap dancer) joining us at 8:30pm, and Cait Jones (vocalist) joining us at 9pm! Join The Hot Toddies on Saturday, February 9th for a swinging night of dancing & lounging at one of our fav spots, Hofbräu Bierhaus NYC!! We'll be doing 3 long sets of hot jazz n swing starting at 7pm including Gabe Terracciano (violin), Matt Quinones (bass), and Patrick Soluri (drums). Join The Hot Toddies on Saturday, January 26th for a swinging night of dancing & lounging at one of our fav spots, Hofbräu Bierhaus NYC!! We'll be doing 3 long sets of hot jazz n swing starting at 7pm featuring Gabe Terracciano (violin), Justin Poindexter (guitar), Ian Hutchison (bass), Patrick Soluri (drums), plus special guest vocalist Cait Jones. Doors open at 9pm with live hot jazz & swing music. Open bar from 10pm-1am. Ticket DOES NOT guarantee you a table. Seating on first come, first serve basis starting at 9pm. with Gabe Terracciano (violin), Vinny Raniolo (guitar), Ian Hutchison (bass), Patrick Soluri (drums), plus guest singer Brianna Thomas. with Gabe Terracciano (violin), Gordon Webster (piano), Arnt Arntzen (guitar), Matt Quinones (bass), Patrick Soluri (drums), and guest singer Cait Jones. with Gabe Terracciano (violin), Justin Poindexter (guitar), Matt Quinones (bass), Patrick Soluri (drums). Join The Hot Toddies on Thursday, Dec 6th for a swinging night of dancing & lounging at one of our fav spots, Hofbräu Bierhaus NYC!! We'll be doing 3 long sets of hot jazz n swing starting at 7pm featuring Mariel Bildsten (trombone), Nico Sarbanes (trumpet), Justin Poindexter (guitar), Matt Quinones (bass), Patrick Soluri (drums). with Gabe Terracciano (violin), Gordon Webster (piano), Nick Russo (guitar), Matt Quinones (bass), Patrick Soluri (drums). Join The Hot Toddies every Tuesday at the beautiful Art Deco inspired ELSIE ROOFTOP... a lavish new lounge perched on the 25th floor, just steps from Times Square and Bryant Park! Featuring exquisite cocktail and inspired food by celebrity chef David Burke. OCTOBER 9th: Gabe Terracciano (violin & vocals), Nick Russo (guitar), Matt Quinones (bass), Patrick Soluri (drums). OCTOBER 17th (6-9pm): date moved from Tues to Wednesday bc of private event - with Gabe Terracciano (violin & vocals), Nico Sarbanes(trumpet & vocals), Justin Poindexter (guitar), Matt Quinones (bass), Patrick Soluri (drums). OCTOBER 23rd: Gabe Terracciano (violin & vocals), Amos Rose (guitar & vocals), Philip Ambuel (bass), Patrick Soluri (drums). OCTOBER 30th: TBA, Nick Russo (guitar), TBA (bass), Patrick Soluri(drums). 1412 Broadway (btw 39th & 40th) at 25th floor. 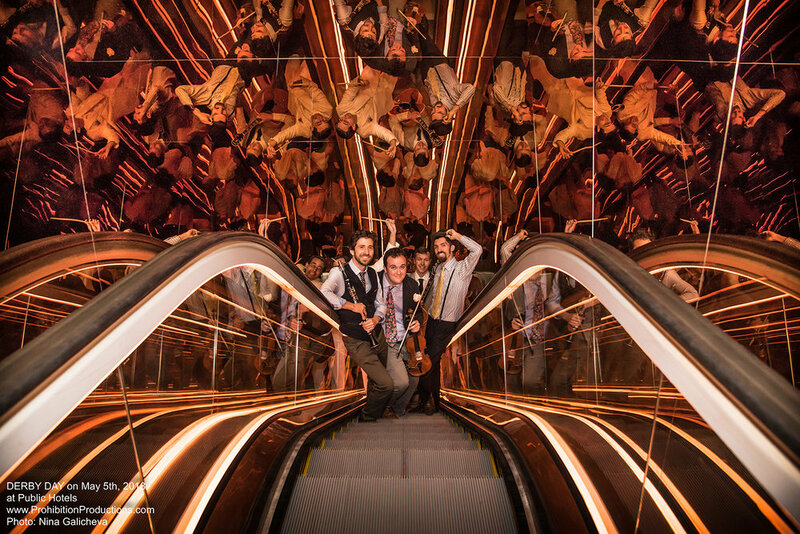 Join The Hot Toddies at the beautiful and swanky Top of the Standard, featuring opulent penthouse lounge atop Standard Hotel with expansive views! The quartet will be doing 3 sets of hot jazz & swing from 6:30 to 9:30pm featuring Gabe Terracciano (violin), Justin Poindexter (guitar), Matt Quinones (bass), and Patrick Soluri (drums). The quartet will be doing 3 sets of hot jazz & swing from 6:30 to 9:30pm featuring Mariel Bildsten (trombone), Amos Rose (guitar & vocals), Matt Quinones (bass), and Patrick Soluri (drums). The quartet will be doing 3 sets of hot jazz & swing from 6:30 to 9:30pm featuring Gabe Terracciano (violin), Vinny Raniolo (guitar), Matt Quinones(bass), and Patrick Soluri (drums). Join The Hot Toddies on Tuesday, August 21st for a swinging night on an intimate rooftop lounge and bar in Cheslea, featuring great drink & food specials, and the best part... NO COVER! at Public Arts for the PUBLIC HOTEL. Join us for hot jazz & swing by The Hot Toddies, burlesque by Lilin Lace; DJ VaVa VOON... und excellent drink specials; just 2 blocks from Grand Central - NO COVER or MINIMUM! party at the new Elsie Rooftop on 39th & Broadway. We'll be doing 3 sets of hot jazz n swing with Gabe Terracciano (violin & vocals), Matt Quinones (bass), Patrick Soluri (drums), and more! Join us for lounging, listening, and fantastic food & drinks at the DIEGO, the hip cocktail bar in the swanky PUBLIC (an Ian Shrager Hotel).... same spot we played on DERBY DAY! With exquisite cocktails, and an original menu by famed chef Jean-Georges; perfect for after work, or a night on the town! Join The Hot Toddies on Saturday, July 7th for a swinging night of dancing & lounging at one of our fav spots, Hofbräu Bierhaus NYC!! They're gonna clear tables for dancing (like they do for us on Mondays). We'll be doing 3 sets of hot jazz n swing starting at 7pm. Including Gabe Terracciano (violin & vocals), Matt Quinones (bass), Patrick Soluri (drums). Join us for a Rooftop BBQ at the Royalton Park Avenue (28th St & Park Ave), with live hot jazz n swing on the Pool Deck, and a view of the fireworks! Join The Hot Toddies on Saturday, May 19th for a swinging night of dancing & lounging at one of our fav spots, Hofbräu Bierhaus NYC!! They're gonna clear tables for dancing (like they do for us on Mondays). The Hot Toddies are thrilled to be playing the 2018 Spring Gala at The Players Club. This is a private members only event with open bar and food, but if interested in attending as a members guest, please contact Patrick Soluri to arrange for tickets. Join The Hot Toddies on Saturday, May 5th to celebrate both Derby Day & Cinco de Mayo with a swinging night of dancing & lounging at one of our fav spots, Hofbräu Bierhaus NYC!! They're gonna clear tables for dancing (like they do for us on Mondays). 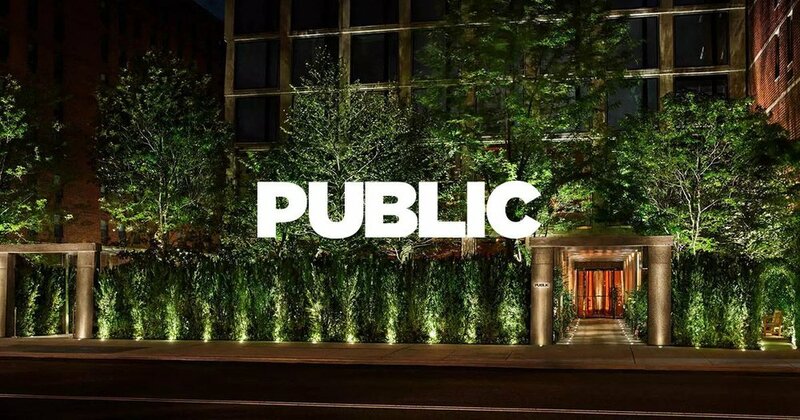 We're thrilled to present our annual Derby soiree at the swanky new PUBLIC (an Ian Schrager Hotel) - one the hottest new spots in town! Join us for a day of dancing and lounging with classic Southern Hospitality, Mint Juleps, live music, DJs, and classic burlesque... so wear your best derby hat n'bow tie! We'll be in the swanky cocktail Lounge DIEGO... our own room dedicated to hot jazz n' swing music, as well as the entire floor! Contemporary DJs will spin in the club, PUBLIC ARTS, on the lower level, and up on the posh rooftop lounge until late in the evening. Sip the "Special Batch" of Mint Juleps and place your Raceday "Squares" - put on your Derby Day outfit, grab your hat and get ready for the race of the year! Join The Hot Toddies on Thursday, April 26th for a swinging night of dancing & lounging at one of our fav spots, Hofbräu Bierhaus NYC!! They're gonna clear tables for dancing (like they do for us on Mondays). All ages / no cover or minimum!